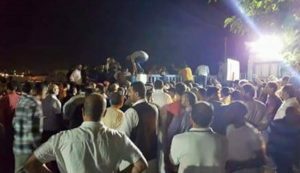 For the second day running there have been anti-French protests in a number of towns and cities in western Libya – from Zuwara to Misrata – although, being Friday, they were larger and were numerous. In Tripoli, hundreds of protestors turned up in Martyrs’ Square where French flags were burned. Flags were burned too in Misrata, in Gharyan, Sabratha and elsewhere. However in the capital as well as Misrata, the mood of the demonstrators, angry at the confirmation of French forces active in Benghazi, rapidly changed to demands that the Presidency Council (PC) be sacked and replaced by a supreme revolutionaries’ council. Later, protestors turned up at the foreign ministry again protesting at foreign intervention. They then moved on to the nearby Bu Setta naval headquarters, where the Presidency Council had been based until 11 days ago, and tried to force their way in, demanding that the council and the Government of National Accord be removed. Although Serraj is now based at the prime ministry office, there are unconfirmed reports that he was at the base at the time but managed to leave before the protestors arrived. The demands him and his government to be sacked are seen as being orchestrated by controversial cleric Sadek Al-Ghariani together with hardline Misrata milita leader Salah Badi and former GNC-regime prime minister Omar Hassi, using the French issue as a means to engineer a change of regime. In Zawia, protestors demanded that gas supplies to Europe be cut off. Libyan gas is supplied almost entirely to Italy.